Gem artisans with decades of experience adeptly cut these gorgeous gemstones, Kaisilver salutes the skills and passion of the finest gem craftsmen in Thailand and other parts of the globe. 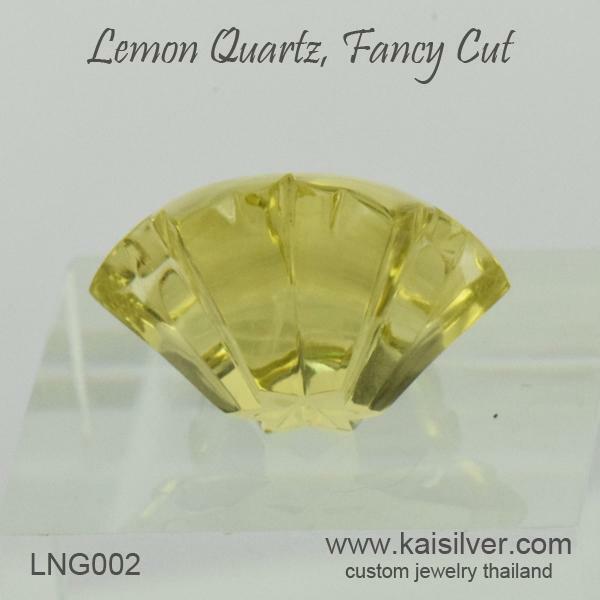 Lemon quartz as a gemstone is not very rare but, a very tiny portion of all that is mined, is fortunate enough to fall into the hands of a dedicated and talented gem cutter. A true gem connoisseur realizes that it is not only the rarity or extravagant price of a gem that needs admiration, the skills of the gem cutter can play a major role in bringing out the hidden beauty that exists in exquisitely formed natural creations. 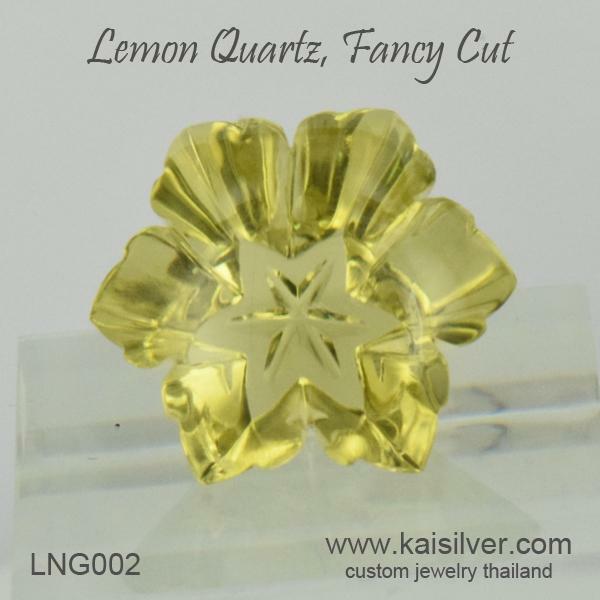 Shaping, cutting and polishing these speciality cut gemstones can take several days or weeks at times, the cutter invests an entire month's efforts into the process. It is quite normal for a piece of rough gem to lose around 80% to 90% of its weight to deliver the final masterpiece. And when it comes to intricate shapes and features like those seen in this big lemon quartz gem, the cutter can discard at least half a dozen pieces before striking the right note. Even the most experienced gem artist realizes that, he might never be able to replicate an exact replica of his own work - the mind, body, mood and creativity rarely work together based on fixed formulas and calculations. 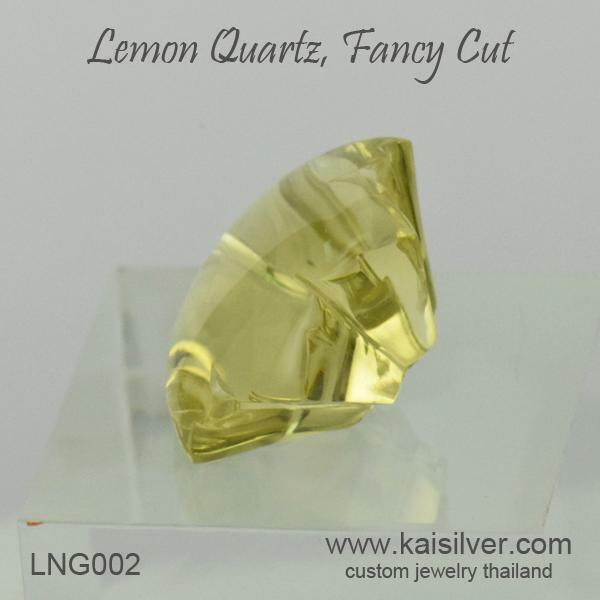 The fancy cut lemon quartz shown here has large dimensions that measure 16x16mm and an optimum depth of 8mm. A creative designer could fashion an eye catching ring or stunning pendant with this gemstone. The gemstone weighs around 12-15 carats. Given the level of expertise and talent that goes into cutting such unique one-of-a-kind pieces, it is absolutely unfair to expect per carat prices to match the conventionally cut and shaped gems available in gem markets. This magnificently shaped and polished gemstone can be yours for just 450 U.S$. Consider buying it only if you truly understand and appreciate the spectacular word of gem artistry. Contact our experts at sales@kaisilver.com for any questions or requirements that you might have. We can often accommodate requests for custom cut gems with your choice of gem, dimensions and shape - it would generally depend on our capacity utilization at that point of time. Given the high rate of rough gem consumption to create every gemstone masterpiece, it is recommended that moderately priced gems be utilized for such creations. We have found the following gems to be suitable for such intricate gem cuts and shapes - white quartz, white topaz, blue topaz, smoky quartz, medium to light color amethyst, lemon quartz, champagne quartz and some of the synthetic lab created gems.